Cartagena (Carthagene, or Cartagena de Indias), a is a large port city on the north coast of Colombia. Founded in 1533 by Don Pedro de Heredia it was named after the port of Cartagena in Spain's Murcia region. Cartagena was major port of the Spanish Main but was located near the beginning of the trade route instead of the end. As such it was not normally the best candidate for pillaging. Today it continues to be an economic hub as well as a popular tourist destination for Colombia. At the time of its founding Cartagena the area was populated by the Calamarí people. This native population was part of a native tribe called the Mocanáes; they were believed to be fierce and warlike and it is claimed that even women in battle. Within a few years of the Spanish arrival a walled military fortress was erected to protect the city against the plundering of English, Dutch and French pirates. Despite the precautions, the city was attacked many times. One of the early attacks came in 1551 when the French pirate Roberto Baal forced Governor Pedro de Heredia to flee. The pirates demanded an unspecified ransom of gold and silver and left upon payment. Eight years later another French pirate, Martín Cote arrived in Cartagena demanding a ransom to prevent a total destruction of the city. It is said Maridalo had put up a stiff resistance but the plunder taken by Cote was enormous. The most famous privateer/ pirate to attack Cartagena was Francis Drake. Drake attacked the city in 1572. As he attacked a large number of Spaniards fled to Turbaco, a nearby village leaving the rest of Cartagena unprotected and helpless. It is claimed that Drake burned the houses and destroyed a nave of the Cathedral in Cartagena. The ransom for the city was estimated 107,000 ducats, an unknown amount of gems and jewels, 80 artillery pieces and other assorted goods. Also in 1568, the English pirate, John Hawkins attempted for seven days to take the city but left empty handed. By the 1600s, the Spanish began improving the defenses of the city and many of the fortresses built at this time, remain intact today. The improved fortifications did much to stop the continual attacks by organized large scale attacks by pirates and privateers of nations at war with Spain. 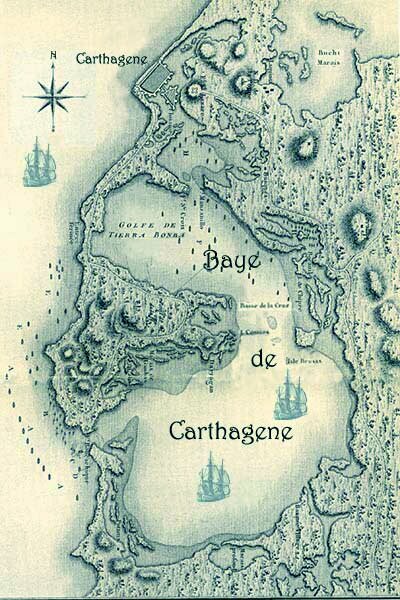 Probably the most serious threat to Cartagena after Drake was Captain Henry Morgan’s aborted attack in 1668. Fearing an expected invasion of Jamaica in October 1668 Governor Modyford gave Morgan permission to make pre-emptive attacks on Spanish ships and ports. Modyford and Morgan agreed that Cartagena, Spain's biggest harbor would be a good choice. Unfortunately while Morgan was at Cow Island his ship the Oxford exploded under mysterious conditions. The explosion was estimated to have killed between 300 and 900 of Morgan’s men. With the loss of the ship and so many men Morgan felt that Cartagena would be too large a target. He decided to instead attempt the harbor town of Maracaibo. The raid on Maracaibo while successful yielded little booty. Most of the city had fled before the buccaneers had landed. Morgan sent out search parties to track down some of the citizens hiding in the forests. They found at least some people, but still not much money was to be had. So Morgan instead decided to take his fleet further into the Lagoon of Maracaibo towards the town of Gibraltar at its southern end. But once again, the people were already gone. There has been a lot of speculation on how the Oxford blew up and the lack of results during this voyage of Morgan. It has also been a stain on his career as a buccaneer. After Morgan’s aborted attack, the Baron of Pointis was finally able to break into the city again in 1697. Slaves in the city revolted when Pointis attacked which aided in his ability to breech the city walls. When the slaves realized the Pointis wasn't going to stick around they quickly dropped their support, concerned more with what retribution they would face once Pointis left. The last real attack came in 1741 and was led by Admiral Edward Vernon, this time a regular English Navy attack. Cartagena was able to resist the 350 bombs that the English dropped onto the city. After a bloody fight and numerous loses, Vernon suspended the attack and left for Jamaica. Cartagena was famous (or infamous) as being on of only two Spanish colonial cities that possessed a Slave market; the other city being Vera Cruz Mexico. The first African slaves were brought by Pedro de Heredia were forced to open roads so the Spaniards could raid the tombs of the Sinu in search of silver and gold. They also were used for cutting sugar cane and building of fortresses. The Spanish Inquisition also operated from Cartagena beginning in 1610. The Inquisition Palace was finished in 1770 and is still there with its original features of colonial times. Cartagena declared its complete independence from Spain on November 11th, 1811. At this point the inquisitors were urged to leave the city. The Inquisition returned after the Re-conquest in 1815, but it disappeared for good when Spain surrendered six years later when Simón Bolívar led Colombia to complete independence. . During its two centuries of existence, the Inquisition carried out twelve autos-da-fé (Public announcement of the sentences imposed by the Inquisition). In total 767 defendants were punished with at least six being burned at the stake. In colonial times, the Spaniards also built a series of constructions and fortresses to defend the city, such as San Sebastian de Pastelillo Fort, in Manga neighborhood, and the Saint Philip of Barajas Castle, in honor of the King Philip IV. In the 18th century, the Vaults were constructed by the Spanish engineer Antonio de Arévalo. Outside the city, San Fernando and San José forts were located strategically at the entrance of the bay to entrench the pirate vessels that attacked the city.